Switcher Studio - build your brand through better social video. 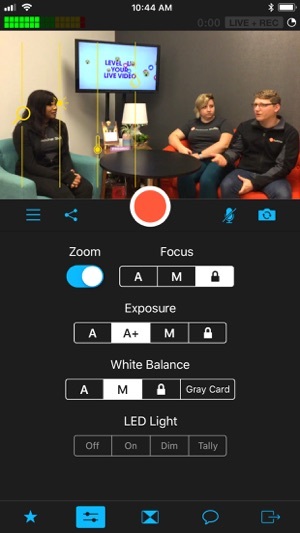 Make video with your iPhone or iPad and a Switcher account - Edit while you shoot and switch between cameras, photos and video so you don't have to waste time later. No need to spend thousands of dollars on special gear. Stream live to YouTube and Facebook, capture 1080p or 4K TV quality video, or output video to a projector or external display. Simple interface makes it easy to look like a pro - which means better looking video, more engaged viewers and better results. 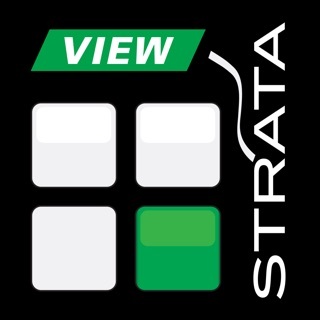 Switcher Studio includes iOS video mixing app, desktop tools, cloud services and support. - Dynamic Media: Use the built-in camera on your iPhone or iPad and insert photos, graphics, and overlays in your video. All you need is one device. - Stream and Record: In Director Mode you can stream live and record 1080 HD or 4K video from every camera. - Split Screen & Picture-in-Picture: Show PowerPoints, Keynote Presentations, videos, documents, website and more by sharing you computer screen or iOS display and other apps via Switcher Cast (available for MAC, PC and iOS). - Using Switcher Studio you can also wirelessly sync up to 9 iPhones or iPads to use as cameras or tap into video from Switcher Go users to crowd source content and take advantage of advanced camera controls. - Easily broadcast live video with just a single tap using “Switcher Cloud Services” to sync your account with YouTube or Facebook Live. - Want to stream to other services like Twitter, Vimeo, Ustream, YouNow, Twitch and more? Just enter your RTMP stream name and stream URL to start broadcasting. - Run a SpeedTest to automatically configure streaming settings and manage live events in the app or from your online account. - Remotely manage streaming accounts from another location via “Switcher Cloud Services”. - Assign one iOS device as your 'main switcher.' Record on the main switcher only, or record on all cameras. You decide what's best. 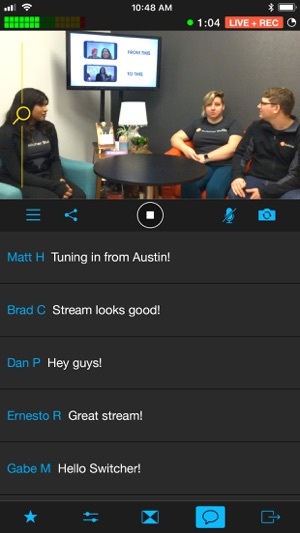 - Set the app to Broadcast LIVE without using storage on your device. Never delete photos or apps again! - Output your program feed or the entire screen to your TV, a projector or an external monitor with HDMI output and AirPlay support. Switcher Studio has added great new features that make the experience of recording and streaming high quality video with one or more iOS devices that much better. - Assign fixed frame rates to your final composition. - Capture 1080p HD or 4K broadcast quality video from multiple angles using iOS devices. - Manage advanced settings and record video at bitrates of up to 50MB. - Record only, or broadcast at any quality while simultaneously capturing in HD. - Preview the completed video on your device as soon as you stop recording. - Composite TV quality video directly on your iPhone or iPad and upload immediately. - Export your compositions to Apple Final Cut Pro X to make additional edits before publishing (special instructions available for exporting to other editing software). - Edit in FCPX knowing all your angles are automatically in sync and cuts/transitions made during production are still intact going into post-production by using “Switcher Media Manager” for MAC. Some features not available on older devices/versions of iOS. 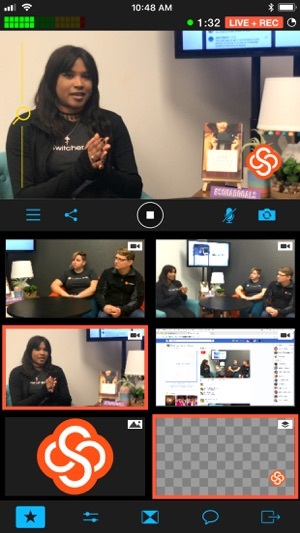 Switcher Studio does not include streaming bandwidth, users must sync app with delivery platform such as FaceBook Live, YouTube LIVE, Periscope Producer, Ustream, YouNow, etc. to broadcast live video. Needs a single purchase price with minimum monthly. Well I really love this app, but paying $30 a month for a limited user like myself is hard to stomach. I actually think I only used it live a couple of times in the year I was subscribed. While this is obviously not a problem of switcher studios, It just makes it hard to justify it. I wish there was a single purchase price and maybe a minor monthly fee. The system itself is well thought out with not too many confusing bells and whistle‘s to get in the way. I’ve used it with an apple router that I take along with me and had great luck. I also use six of the DJI Osmo units and the control is very simple. I rarely broadcast live so I can’t speak to the ability to live stream so much, but as a way to capture Multi camera video for editing later in FCPX it’s fantastic. So on this past week I used your app for a huge conference. I instantly fell in love with with all the features and the idea of “switching”. I am not a videographer or photographer but my team and I were able to use this is no time. Out of no where the system would crash. In the beginning, we believed it to be the internet server that we used but it wasn’t. We had people to pay for the online version for the conference and they were not able to receive what they paid for. The moment we disconnected for. Switched and went directly to Facebook live, we did not have any issues. We desire to pay for the service but we do not want to pay $300 a year for an app when it isn’t reliable. Why does the system shut down and not connect the way that it should?!? Does it disconnect because we are in the trial period?! The app functions the same while on a trial period as with a purchased subscription; this is not the cause of the disconnections. The native Facebook app requires very little bandwidth to go live, so you can go live from anywhere no matter the Internet connection. Switcher Studio requires a more robust network and strong local WiFi for communication between cameras. Conferences are notorious for having poor bandwidth due to so many people trying to connect at once, this is likely the culprit of your dropped connections. Using a mobile data hotspot could help alleviate the issue you experienced. As long as the hotspot has at least 3MBps upload speed and no data throttling enabled, you will be able to use it to go live at your conferences. If you need help setting this up, drop us an email at support@switcherstudio.com, and we’ll walk you through the process! 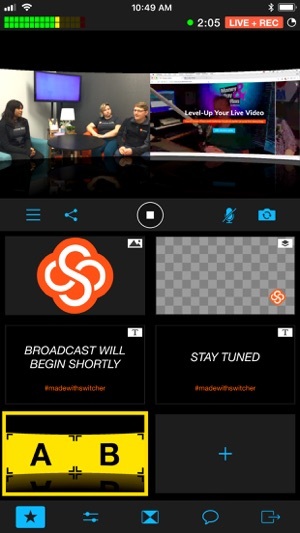 Switcher Studio is a fantastic live-streaming app for networked iOS devices. My one quibble is that, for $300 per year, I would greatly appreciate the flexibility to add a DSLR or camcorder to the mix using the RecoLive software on my Mac. As far as I can tell, Switcher does not recognize some, or perhaps any, video sources running into a Mac - for example, a camcorder connected to the Mac with a Blackmagic Shuttle or Mini Recorder. I think that the $300 annual subscription price is fair, given the functions, ease of use and support that you get with Switcher Studio, yet I can’t help feeling as if enabling non-iOS devices connected to the same network wouldn’t add enormous value to Switcher and its capabilities. Copyright © 2019 Switcher Inc.